There are many different bottle necks in C++ networking applications, many of them related to the architecture, the way system calls are used, the way application generates the data. 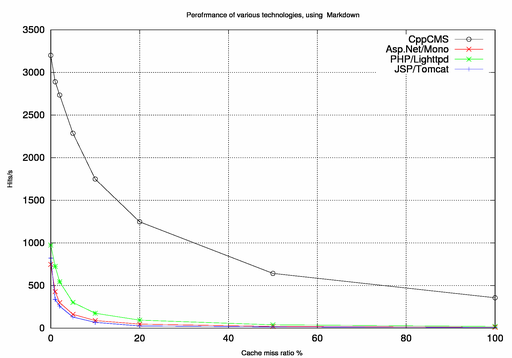 However at certain point applications reach the point when memory allocation becomes the bottle neck, this is especially relevant for the cases where text strings are widely used. And this is usually the case for all networking and web applications that finally need to deal with strings. The old and good std::string has one limitation - it requires memory allocation for the chunk it represents. This is actually correct for almost any kind of string around whether they reference counted, immutable - all they allocate chunks of memory. Consider situation, where I need to search against path /foo/bar/123 in some hierarchical structure like std::map that uses std::string as the key. So I need to find a path using after fetching two keys foo and bar from the path. So I've got three memory allocations and this is not matter whether these strings are mutable or immutable, reference counted or not. CppCMS should handle such code in multiple places so how it solves this problem? Create a special object cppcms::string_key it holds inside a full std::string but also can be created explicitly from a pair of two char const * pointers that define a text in range [begin,end). What is important that in in the second case object does not copy the data but only references it and I'm as a user responsible to ensure that the text range remains valid as long as I use this object. And when we split the text into parts we use only "unowned-strings" such that creation of a strings /foo/bar/123, foo, bar would not require memory allocation at all. It is a general line, but there are much more interesting tricks to deal with 0 or few allocation strings and streams, like creation of a small memory pools that release all strings in once, like using on stack storage for small text chunks and much more. 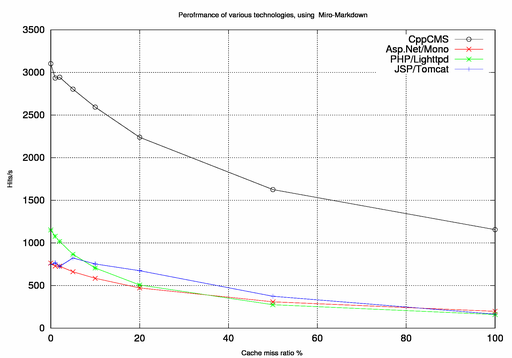 This technique is widely deployed in CppCMS 0.99.9 code and had allowed to improve performance of page generation by up to twice in some cases. Now these tricks should be done careful as they rely on manual memory management so, unless you do something many-many times or you detect some bottle-neck in the application still stick with std::string as it is usually good enough. 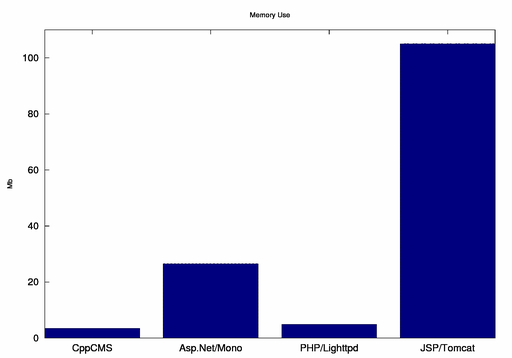 Memory allocation today is very fast, just don't abuse it. During development of CppCMS I have always wanted to do some benchmarks against one of the most popular web development technologies: Asp.Net. I had found a blogging system: BlogEngine.Net that in its latest version had full support of mono under Linux, support of MySQL --- all I need to run benchmarks against CppCMS. The beginning was promising. The instructions were simple, there was an actual blog running BE.Net under Apache mod_mono on Ubuntu. There were Linux specific instructions as well. So, first of all I had installed mono 1.9.1 from Etch backports. The first problem I had to deal with was an installation problem --- the version of C# compiler and mono environment were different. This was solved quite simply. So, I could finally see BE.Net running under Mono using XML as data storage backend. Then, I wanted to add MySQL storage backend. The problems had come very soon. The MySQL database script was written under assumption that table names are case insensitive. That was not true for MySQL under Linux. This problem was fixed.